We are so pleased to share that the Puzzle Time Program is growing. In addition to New York, our United States chapters are in: Oregon, Florida, and California. International chapters include: Russia, China, South Africa, Greece, Spain, Israel, India, Brazil and Japan. 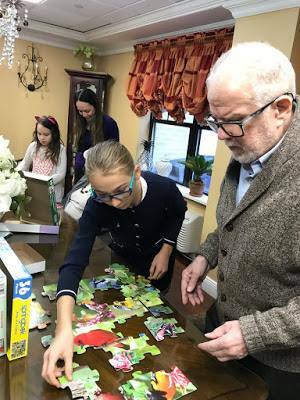 Enjoy these photos from today's Puzzle Time at the 80th Street Residence in New York City. The residents certainly seem to be enjoying themselves, while CBS News, Fox News, and ABC News were quite intrigued. 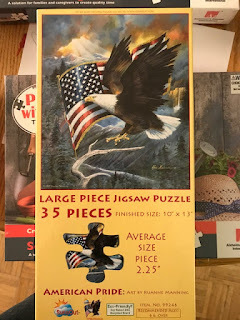 We now have a new program called Puzzle Time. 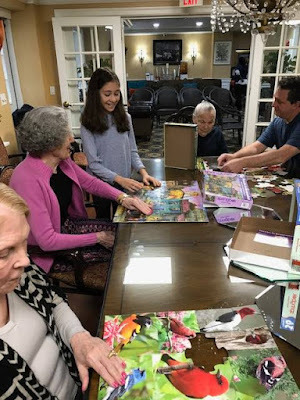 Young people and seniors in nursing facilities are brought together and spend time solving puzzles. 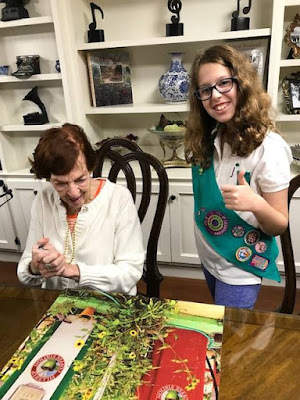 We are supplying the puzzles for this program, and crediting community service hours to students and girl scouts who participate. Numerous high schools have already signed up to participate. Hailey is working on a video to train the students on how best to go about their interactions with the nursing home residents. 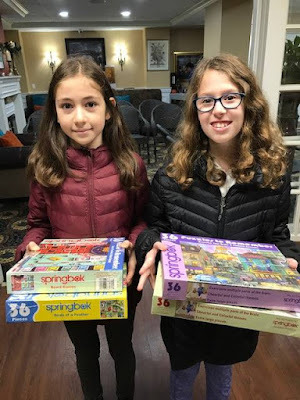 Last week, we brought Springbok Alzheimer's puzzles to a memory care facility. The participating residents had a wonderful time solving the puzzles. We had a lot of conversations about the themes, which ranged from birds to the Eiffel Tower in Paris. We want to thank Springbok Puzzles, once again, for their continuing support of our efforts to provide therapeutic puzzles for those with various levels of dementia. I hope everyone is enjoying their summer! I have been very busy traveling, and working on some projects. I am very happy to share the launching of the PUZZLE TIME program with our partner organization PuzzlesToRemember ! 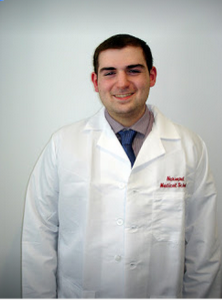 We are currently working with 2 high schools in the NYC area. 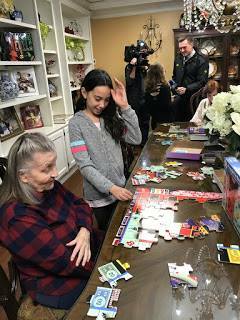 We are pairing up a high school student with a senior afflicted with Alzheimer's Disease for an hour of puzzle-solving. The high school students will receive community service credits (often a requirement for graduation). The benefits of puzzle-solving have been studied by many researchers. This program will bring lots of stimulation and happiness for both of the parties. I am looking forward to training the high school students. I am hoping this program will grow. My dream is for every state to have a PUZZLE TIME program. 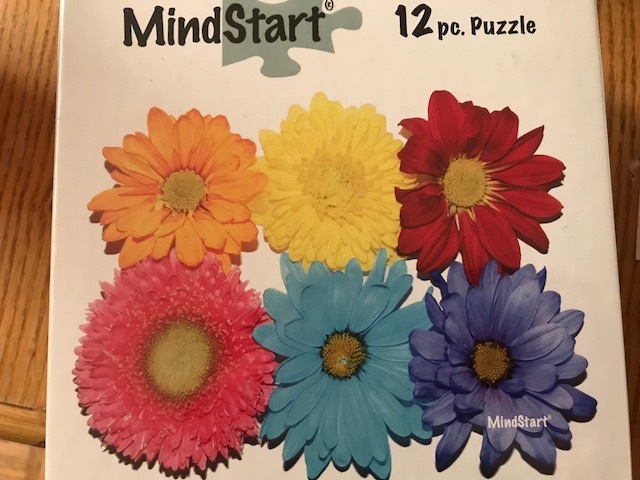 Please reach out to me if you would like to have a PUZZLE TIME program in a specific facility or if you are aware of a high school that would be interested. Our contact information: kidcaregivers@gmail.com Hope to hear from you soon! The Prudential Spirit of Community Awards program is the United States’ largest youth recognition program based exclusively on volunteer community service. 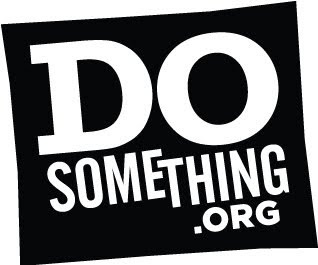 This program recognizes and thanks young people who’ve made a difference and, through their charitable works, inspired others to consider how they might contribute to their communities. 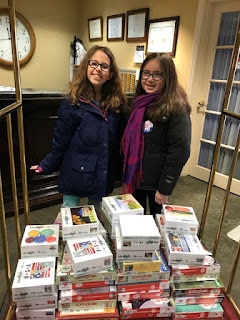 Congratulations to our Associate Director, Hailey Richman, whose work with Puzzles To Remember & Kid Caregivers has earned her a place as a 2018 State Honoree. These puzzles will be brought to nursing facilities in New York City. Hailey will be leading a group of Girl Scouts, who will be distributing the puzzles and spending time doing them with the residents. We thank Vermont Christmas Company for their generous donation. 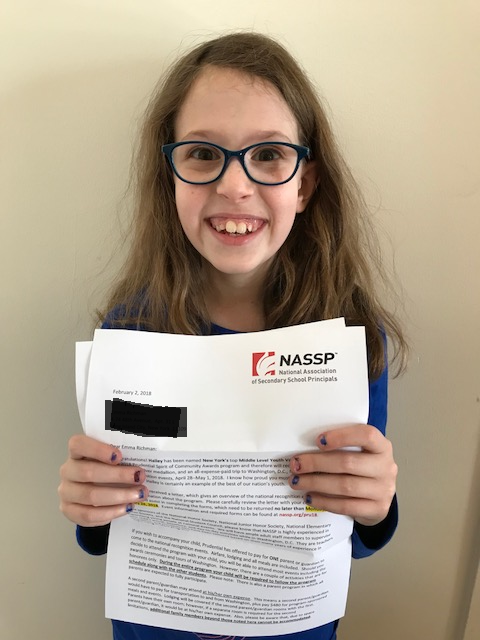 I am very proud of Hailey Richman, PuzzlesToRemember's Associate Director. 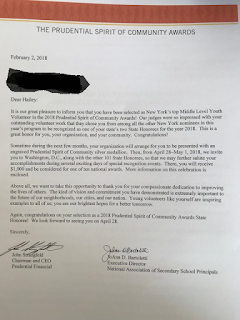 Today, Hailey was informed that she is New York State's Middle School winner of the Prudential Spirit of Community Awards Program for her strong dedication to community service. 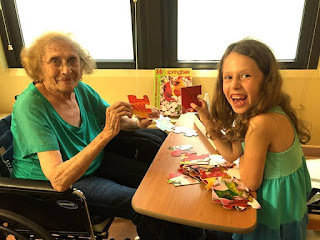 In addition to all the things Hailey does on behalf of PuzzlesToRemember, Hailey also maintains her own organization, www.KidCaregivers.com, where she gives advice to young caregivers dealing with dementia in their family members. Here is a copy of the congratulatory letter Hailey received today. Hailey was invited to attend a prestigious award ceremony in Washington, D.C., in the Spring. 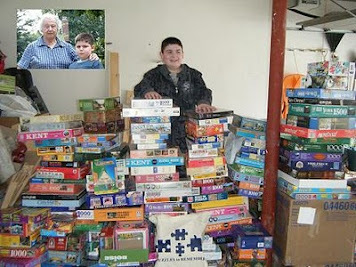 This week, big boxes of puzzles were sent to 45 different Assisted Living Facilities in Maine and Rhode Island. 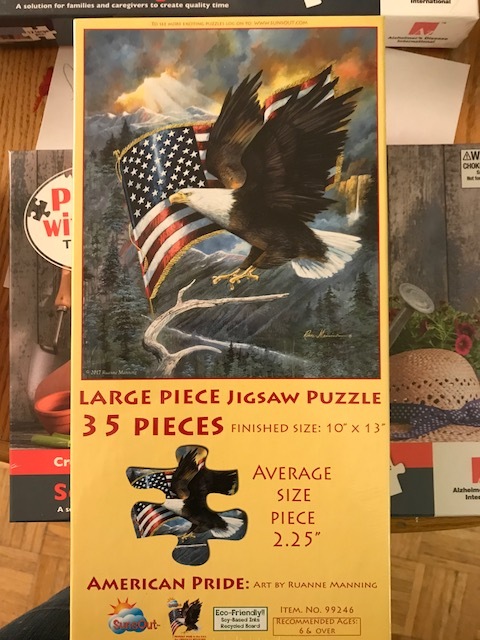 We hope these puzzles will provide many hours of peaceful activity. 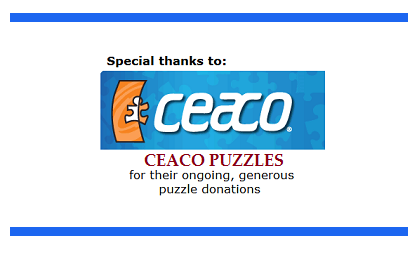 Today PuzzlesToRemember received a request for puzzles from a dementia facility in New Zealand. 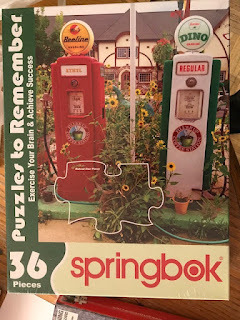 We will be sending them some of the Springbok PuzzlesToRemember. I hope the residents enjoy the puzzles. 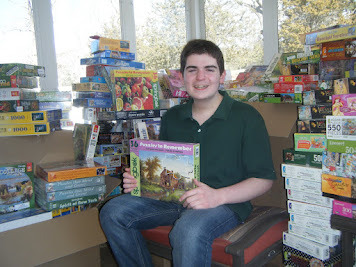 When we receive photos of the puzzles being enjoyed in New Zealand, we will post them. 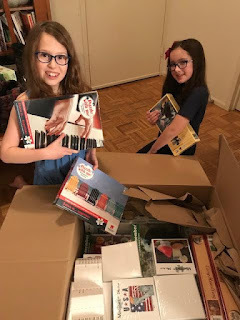 Hailey and I would like to thank the Puzzles Warehouse very much for the large box of puzzles that was delivered to us yesterday. 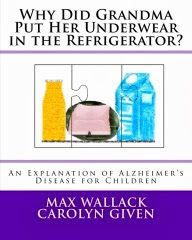 The puzzles are perfect for individuals with Alzheimer’s disease. Hailey will be bringing 4 or more friends to memory care facilities, nursing homes, and assisted living facilities. They will spend time solving the puzzles, and then give them to the facility to keep and reuse with their residents. Your kindness and generosity will help to brighten the lives of people who are living daily with dementia. Here is a photo of Hailey and her friend opening up the box with delight!